ATLANTA – This Sunday will mark the 10th consecutive season the University of Tennessee will be represented in the Super Bowl with New England Patriots wide receiver/kick returner Cordarrelle Patterson and Los Angeles Rams running back John Kelly facing off in Super Bowl LIII at Mercedes-Benz Stadium. 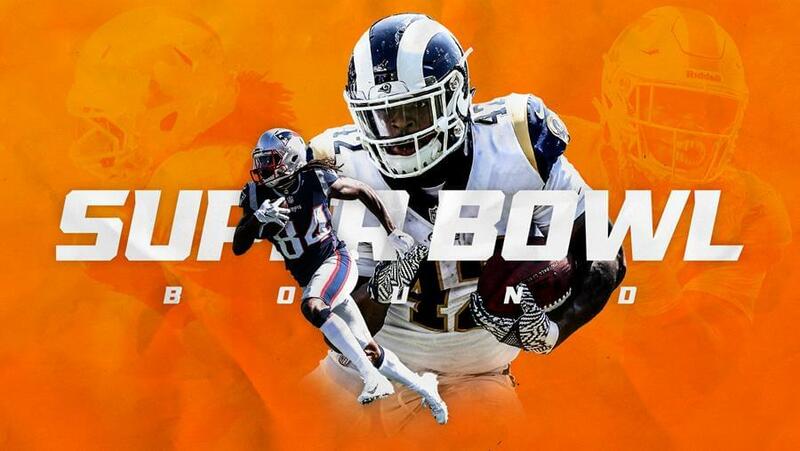 The duo gives the Vols 63 all-time players on active NFL rosters to appear in Super Bowls since the NFL-AFL merger (1970) – the most of any SEC team and tied for the second-most all-time. The Patriots and Rams arrived in Atlanta for Super Bowl week on Sunday night. Patterson, who is one of the fastest players in the NFL, was a do-it-all player in his first year with the Patriots. He averaged 28.8 yards on 23 kick returns with one score. Patterson tallied 21 receptions for 247 yards and three touchdowns and added 228 rushing yards and one touchdown on the ground on 42 carries. Patterson played one season at Tennessee in 2012 under the direction of offensive coordinator Jim Chaney. In 12 starts, Patterson posted 1,858 all-purpose yards and 10 total touchdowns, finding the end zone as a receiver, rusher, kick returner and punt returner. Kelly, a rookie, totaled 74 rushing yards on 27 carries for the Rams this season. He has played in both playoff games on special teams, recording one tackle. At Tennessee, Kelly had a breakout junior campaign in 2017, leading the Vols in rushing (778 yards) and receptions (37) in 11 games. He had nine touchdowns and opened the season with a 128-yard, four-touchdown performance in a double overtime win over Georgia Tech. For his career, Kelly rushed for 1,573 yards and 15 touchdowns. All-time, Tennessee Vols have won 46 Super Bowl championships and have accounted for 91 total Super Bowl appearances. Last season, defensive end Derek Barnett helped the Philadelphia Eagles win the Super Bowl, marking the ninth straight season a Vol has won the championship.